Michael Caruso gets elevation in his Nissan. The Mercedes Supercar fleet will race in Perth for the first time, while Nissan vehicles will return to the track for the first time since 1992. Nissan has a celebrated history at Barbagallo, with George Fury taking out the Wanneroo round in his Nissan Skyline Turbo in 1986. Glen Seton drove the same car to victory the next year. Five-time championship winner Mark Skaife was the last Nissan driver to top the podium in Perth, guiding his GTR to glory in 1991. This year’s meet features four Nissan drivers with Michael Caruso (No. 36), James Moffat (No. 360) and former Bathurst winners Rick (No. 15) and Todd Kelly (No. 7) behind the wheel. Newcomers Mercedes, led by Erebus Motorsport, hope for their best result of the series in Perth, after familiarising themselves with the untested cars in the earlier rounds. Three Mercedes drivers will race in Perth, made up of Tim Slade (No. 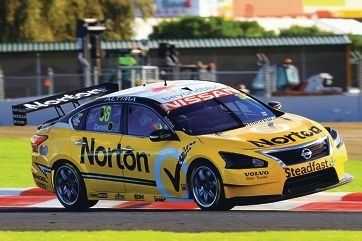 47), Lee Holdsworth (No. 4) and Maro Engel (No. 9).